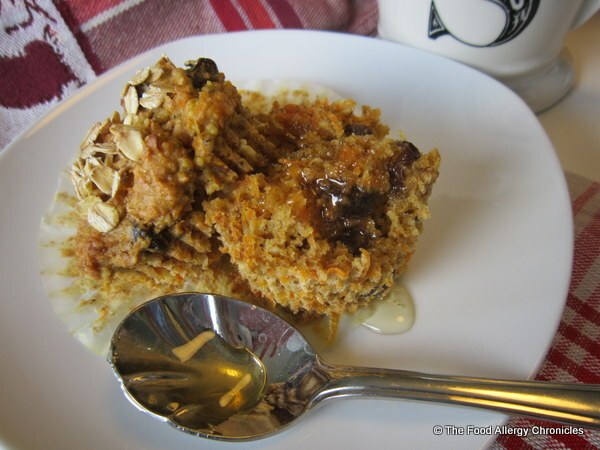 Posted on March 27, 2013 by Susan H.
A touch of orange rind gives Dairy, Egg, Soy and Peanut/Tree Nut Free Oatmeal Carrot Raisin Muffins a ‘little burst of sunshine’! 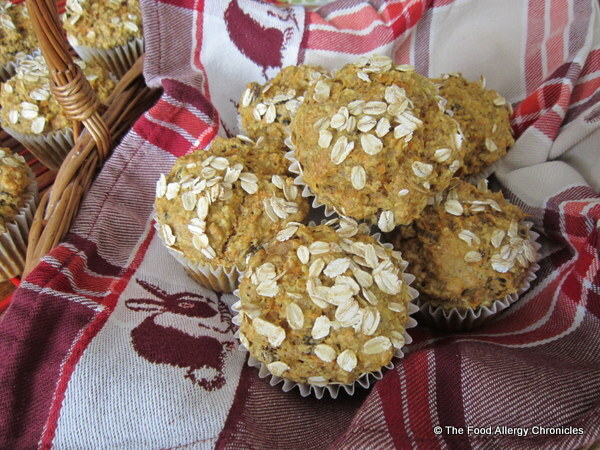 Full of fibre…whole-wheat flour, oats and flax meal…these muffins are full of flavour…while still staying lovely and moist. This recipe was copied down by me a long time ago…unfortunately, I forgot to write the source…unable to give them credit for this yummy muffin recipe that I was able to adapt. Tip: Prepare your flax egg and rice beverage with white vinegar mixture so as they have time to sit. Measure the flour, raisins, granulated sugar, baking powder, baking soda, salt and cinnamon in a large bowl. Pour the rice beverage and vinegar mixture over the quick oats and let sit for 5 minutes. Grate the orange rind and carrots. Add the carrots, orange rind, demerrera sugar, oil, flax egg and 2 tbsp of water to the quick oat mixture…blend well. Add wet ingredients to dry and blend well…mixture will be very thick. 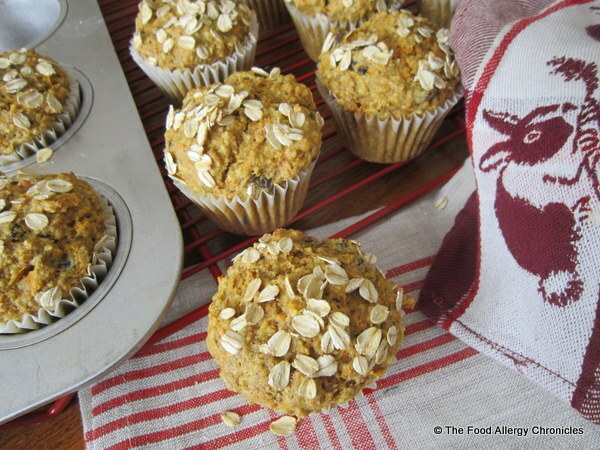 Fill 12 paper lined muffin tins…sprinkle top with whole oats. Bake muffins at 400 F for 20-25 minutes. Let cool on cooling rack for 10 minutes before removing from muffin tin to continue to cool on cooling racks. Lovely warm with a drizzle of local honey! Yummy! Tip: Muffins freeze beautifully…just need a quick pop in the microwave to re-heat. This entry was posted in allergies, baking, breakfast, dairy free, egg free, muffins, multiple food allergies, oats, peanut/tree nut free, soy free and tagged baking with a flax egg, Dairy Egg Soy and Peanut/Tree Nut Free Oatmeal Carrot Raisin Muffins, Natur-a Rice Beverage, Natur-a Soy Beverage by Susan H.. Bookmark the permalink. I am loving this recipe! All it would take is to use some gluten free flour and it would be gluten free as well!! Enjoy! Wow! These have me drooling! I should never read food allergy blogs when hungry. Even though folks think we eat cardboard, they are so very wrong! We eat some of the best foods on the planet! I agree…one would never guess these muffins were made without butter and eggs! 🙂 Enjoy!